Let the Lorne Park Dental team "bridge the gap" left by missing teeth with a stable and natural-looking dental bridge. Dental bridges are permanently cemented restorations that replace missing teeth. These are often constructed of porcelain fused to metal. A bridge is placed over abutment (or "anchoring") teeth, and is attached to a suspended artificial tooth between the anchoring teeth, filling the gap created by the missing tooth. A bridge is a highly durable dental appliance and with proper care can last for many years. What does the dental bridge procedure involve? Getting a dental bridge is a very specialized process that usually requires 2 or more visits. The two anchor teeth are prepared for a bridge by removing a portion of tooth. Impressions are then taken of the upper and lower teeth and sent to a dental laboratory where the new bridge is created. A temporary bridge is made in the clinic and is cemented in place and worn until your next appointment approximately 2 weeks later. 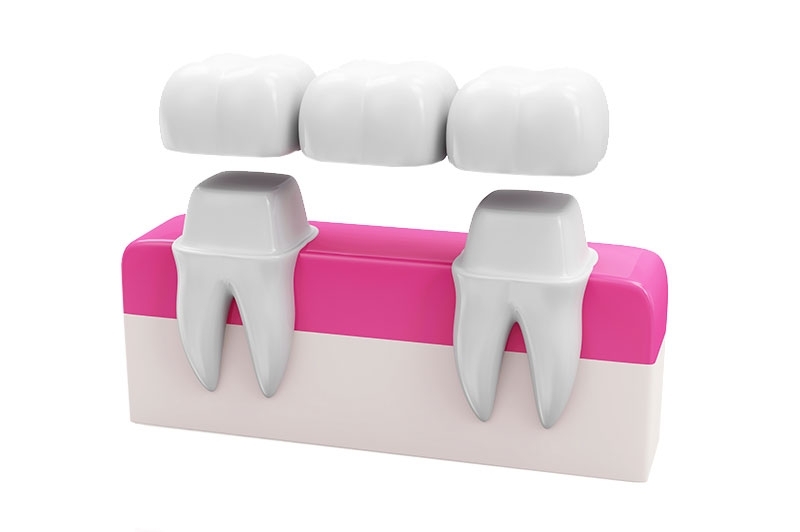 During your second appointment, your new bridge is checked and adjusted before being cemented into place.